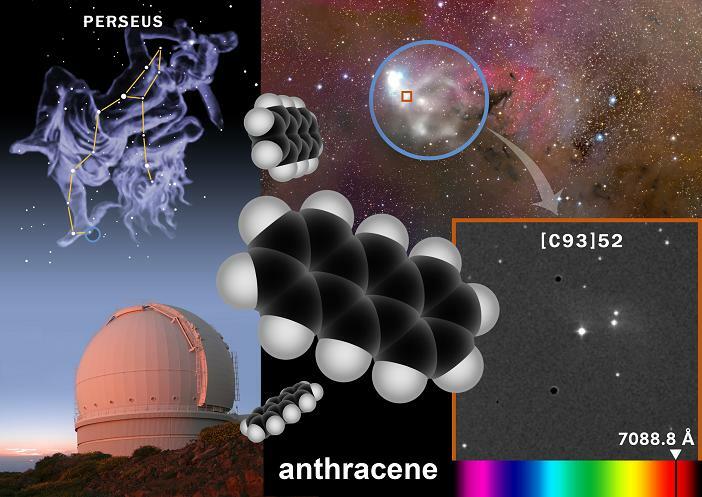 'We have detected the presence of anthracene molecules in a dense cloud in the direction of the star Cernis 52 in Perseus, about 700 light years from the Sun,' explains Susana Iglesias Groth, the IAC researcher heading the study. Since the 1980s, hundreds of bands found in the spectrum of the interstellar medium, known as diffuse spectroscopic bands, have been known to be associated with interstellar matter, but their origin has not been identified until now. This discovery indicates that they could result from molecular forms based on anthracene or naphthalene. Since they are widely distributed in interstellar space, they might have played a key role in the production of many of the organic molecules present at the time of the formation of the Solar System. The results are based on observations carried out at the William Herschel Telescope at Roque de los Muchachos Observatory on La Palma in the Canary Islands and with the Hobby-Eberly Telescope in Texas in the United States.